I travelled to the Abruzzo region on a photography holiday organised by a London-based company called Frui. Here is my account of the trip. 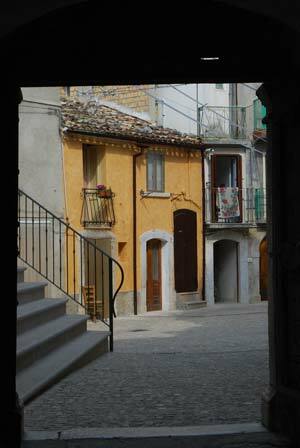 While considering taking a photography holiday in Italy, I came across reports of a course in the Abruzzo region organised by UK company Frui; one of several photography holidays they offer. Just four nights, open to beginners and with the emphasis on conviviality, it sounded like an accessible introduction to both photography and to organised tours (usually I travel independently). 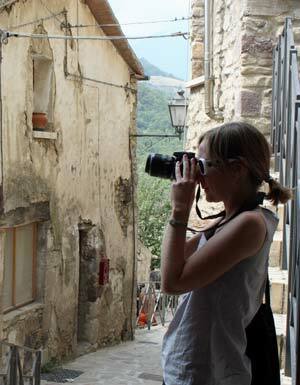 Frui is a travel company specialising in art, photography and cookery holidays. On previous trips they'd invited along journalists, who wrote well-lubricated articles raving about the trip, the tutors and the sociable aspects of the travel. It all sounded very encouraging. This kind of holiday is fairly expensive, but their prices compared favourably with similar ventures, and were all-inclusive. I booked for a trip in September; and as the flights were an optional extra, I met up with the group at Rome Fiumicino Airport. As promised, our group tutors were there holding up a large placard and collecting their 'students'. There were fifteen of us, of ages ranging from (I'd guess) mid-20s to retirement age. We were all solo travellers, apart from a pair of friends, and the group consisted of more women than men. As we began getting to know each other, we were ushered out into two small mini-vans which would drive us around for the next few days. One long but interesting and sociable journey later, we arrived at the plush faux-chalet surroundings of our first hotel, the Villa Danilo, near a little village called Gamberale. After checking in and checking out our comfortable rooms, we rendezvous-ed to get started on the serious business of the holiday: eating and drinking. All the meals and wine - rivers of wine - were included in the price of the holiday, and we ate very well throughout the trip. It wasn't till the following morning, sitting by the hotel's swimming pool, that we began on the other business of the holiday: photography. Our personable tutors Henry, Selwyn and Jake, gave us daily classes, along with individual help and advice. The lessons were fairly basic, but for a novice like me they were invaluable. I'd hired a 'proper' camera for the trip and I was soon trying to memorise the techniques we'd learned, helped by handy little printouts from Henry. 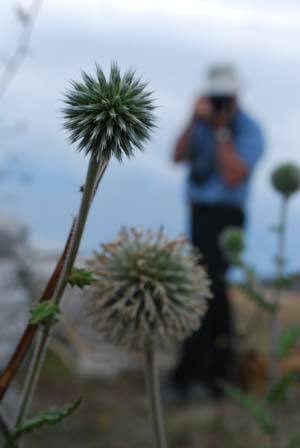 After the learning it was time to put our studies into practice, and in between the eating and the tutorial time we fitted in excursions to a a number of different sites where we could try out our photography skills. This worked very well; we could wander off alone or in company, searching out interesting angles. The villages we visited were small, so the tutors could keep track of us and give assistance or advice wherever requested. After our first lesson we visited the village of Pescocostanzo, a pretty and well-kept place with big views over this high-altitude landscape. I think it was on that first full day that we enjoyed one of my highlights of the trip: a surprise picnic on the wooded hillside of the Majella National Park. Waiting for us in a clearing were the staff from the hotel, preparing a wonderful feast for us to eat at picnic tables. 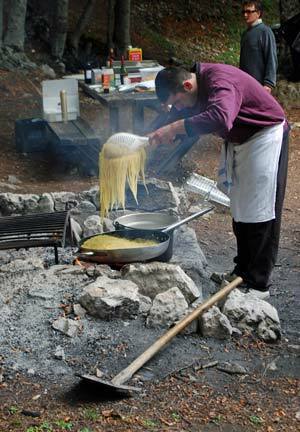 Wine and beer lay chilling in a cool spring, the pasta was cooked on an open fire; it was a truly memorable experience. Later that day came another highlight: the chance to watch a truffle-hunter and his dogs at work... before eating another fine meal including pizza with truffles. 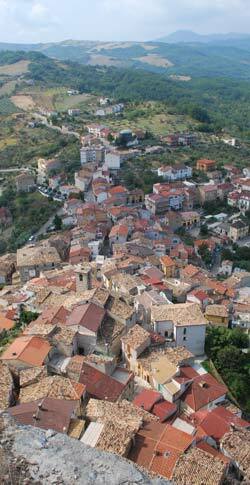 Our second base was a much more basic hotel, in a small town called Torricella Peligna, a fairly drab place with a few picturesque views. The food again, was excellent: local produce, traditional local dishes and the full Italian range of courses. One evening we ate at an atmospheric little agriturismo where we tasted local cheese and honey and settled down for another huge meal. There was always a vegetarian option specially prepared for me when the others had a meat course, which gave me the chance to sample even more local specialities. Another, lunchtime, agriturismo meal was finished off by a wonderful display of local folk-dancing and singing. Not just local to the region, but local to that specific neighbourhood. It was a colourful and moving expression of the local character. 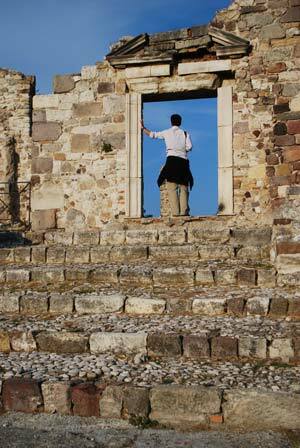 During the holiday we visited a number of interesting spots in the Abruzzo. These were generally small and picturesque places with nothing grand or showy to distract us from our task of finding and taking photos. As well as Pescocostanzo, we visited Gessopalena, a small town with a wonderfully atmospheric ruined settlement, Pennadomo, where the locals humoured these fifteen foreigners with big cameras wanting to photoraph them about their daily business, and the imposing castle of Roccascalegna. Each day we had twenty-minute one-to-ones with a tutor, looking over some of our photos from that day. Then, as a group, we would look at one or two photographs from each traveller, sharing positive feedback. This wasn't just a mutual grooming exercise; I found I could learn a lot from witnessing other people's ideas. Since we'd all been photographing the same sites, it was fascinating to see how many different 'takes' on each subject there were. As a final project, we each prepared a small collection of our photos based around a theme we had been allocated. Then over dinner we voted for our favourites. All the projects impressed me, and after four days of friendship-forming and perhaps minor irritations, it was perhaps hard to make an objective judgement. I am proud to say that I had a placing (something like joint third, I think). The highlights of my holiday were the entertaining lesson on shutter speed, when our tutors jumped and bounded tirelessly to demonstrate the effects, the colourful display of folk singing and dancing, and the wonderful open-air meal in the woods. I came away with some great memories and new friends. I'm not sure about the quality of the photographs I took; but I certainly learned a lot even if I haven't yet put it all into practice. I'm still happy with my reliable 'bridge' camera, and I have to admit I still generally use its automatic settings. But I remember some of the lessons I learned, and I think my attitude to taking photographs - and to judging them - has progressed. This holiday was aimed at levels from complete beginner upwards. I think if you want to concentrate on serious, intensive learning, there might be more earnest courses available, but this trip was a good balance of fun, travel, local interest, dining, learning and photography. - The excellent meals, which I can still remember in greedy detail. I enjoyed the Abruzzo holiday, and didn't really have any criticism of the trip, but I think some guests found that the amount of driving in small mini-vans was quite uncomfortable, and others would have liked more intensive tuition. As someone who is not always resident in Britain, I was mildly surprised by the volume of late-night drinking that went on, but that was an entirely optional extra (except perhaps for the indefatigable tutors, who cheerfully kept guests company till the small hours, then had to teach and drive the following morning). It was my first experience of a group holiday, and I agreed with a fellow-guest who said wisely, as keen females and photography buffs vied for attention of the youthful tutors over our final dinner, 'It's interesting to watch the group dynamic developing'. Five days probably isn't enough for serious problems or factions to form; my group, anyway, was very good company. In early September the weather was surprisingly cool - I'd just travelled from the islands and beaches of southern Italy, and found I needed more substantial clothing; the Abruzzo is high and less warm that the coast. As well as a jacket, I also wished I'd prepared myself with some historical information about the area. Intriguing and moving war memorials peppered these small traditional towns and villages, which obviously have fascinating stories to tell. This is an accurate report of my experience on the photography holiday. However, please note that Italy Heaven cannot take responsibility for any companies or organised holidays featured on this website.